Yes I finally published a post after ages! Thank you one and all, for all the comments and emails- they kept me smiling and I finally responded to each of them!! I was caught up in personal stuff. Several bouts of colds for the whole family, my son’s first major Toddler Tumble, and general pensiveness. The kind of things a (new-ish) mom worries about- am I doing the right thing? Am I spending enough time with my son? Am I dealing with temper tantrums correctly? Is taking a prolonged break from an office job the right thing to do? How long is too long? Would I- gasp– even be considered employable again? But I also realized that there’s no point dwelling on the things you can’t really measure. And that you enjoy motherhood as it happens to you. I also realized I have a deep passion for food, as well as for putting my thoughts down on paper (actually, a word processor) and that by ignoring this space, I wasn’t doing anything to feed that passion. Anyway. I got back to baking and this is what I made. You can see a portion nicked off on the upper left- I had to place it back, jigsaw-like, because I realized I hadn’t taken a picture. I was in that much of a hurry to eat it. Like I said in my last post, I had the amazing chance to attend The Purple Foodie baking workshop in January and I must say it was the best 6 hours I have spent with butter, sugar and flour ever! I learnt so much, got to meet a bunch of wonderful women who also have a serious passion for baking and I can now safely say that my cakes look, feel and taste better. 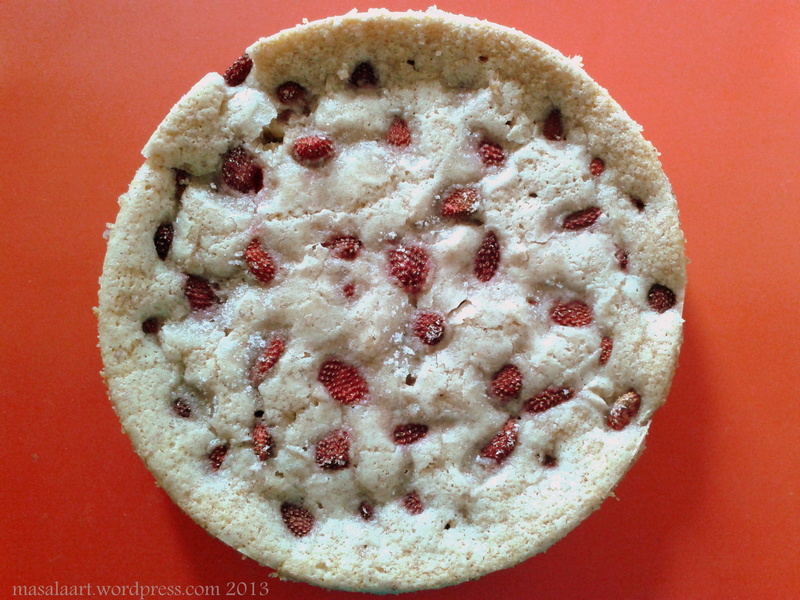 I tweaked this recipe from The Purple Foodie workshop- Shaheen’s Strawberry and Roast Almond Cake- except that I didn’t add roast almonds. Instead, I added some almond meal into the batter. After the workshop, I’ve become a huge fan of almond meal! Shaheen told us that you could always switch a measure of flour and replace it with almond meal for added richness. It really does add a lovely, nibbly richness to the cake. I had to make this before strawberry season ended. And since Valentine’s Day was upon us, and red hearts and balloons were everywhere, strawberries seemed perfect. When Valentine’s Day comes around I feel the need to do something cheesy but not heavily so. Cake is cool. Cake is classy. And it’s something you wouldn’t want to say no to. So I got to work. I think I may have added a few more strawberries than I should have. I sprinkled a gentle snowfall of sugar on top. I love how strawberries bleed their colour so beautifully- just blushing into the batter. 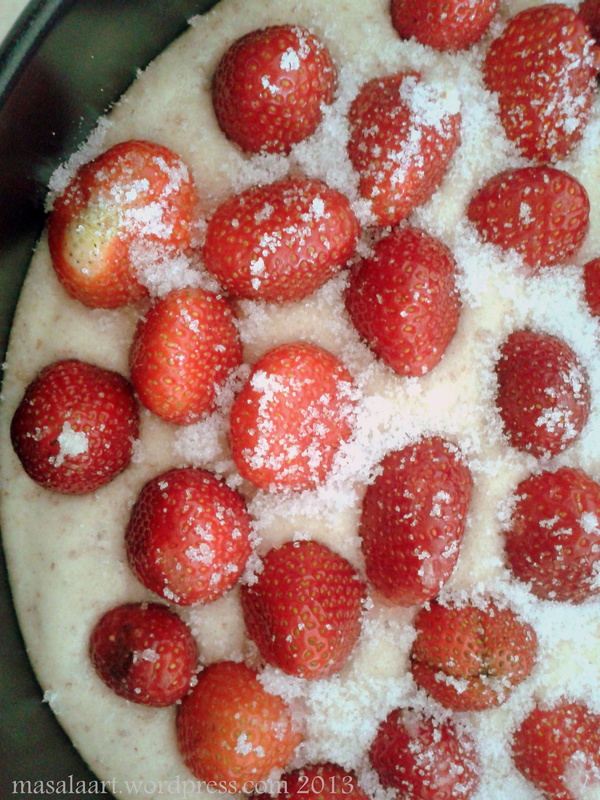 This cake turned out lovely- but I think I may have pushed in a little too many strawberries. 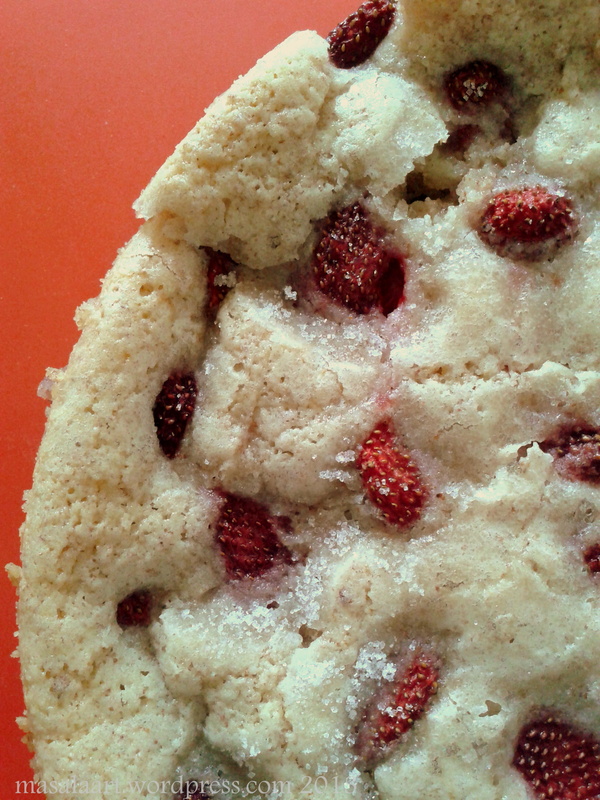 The juices of the strawberry really seeped into the batter, so it turned out to be a little wobbly in pockets- not as firm as the one we baked in the workshop. This could also be because I used more almond meal than flour, not sure though. (Master bakers, any thoughts?) But it was quite lovely to eat all the same; because there was so much strawberry in every bite…and these strawberries were really top-notch and sweet. NOTE: The original recipe by Shaheen calls for 180 grams of flour instead of 80 g flour + 100 g almond meal. It also called for 200 grams of chopped roasted almonds which are added to the batter before baking. Line baking dish with butter paper. Whisk together the flour and baking powder in a bowl and set aside. 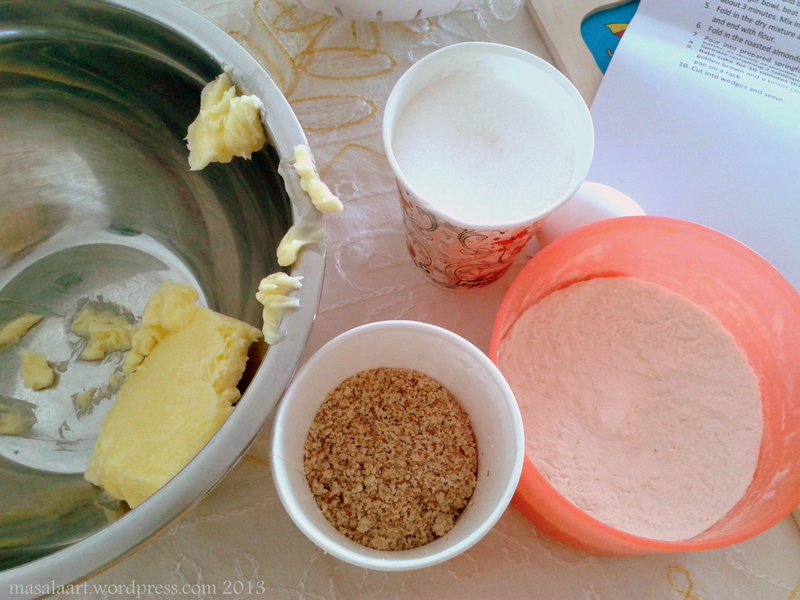 In a large bowl, cream the butter and sugar till light and fluffy. Next, add the egg and vanilla till just combined. 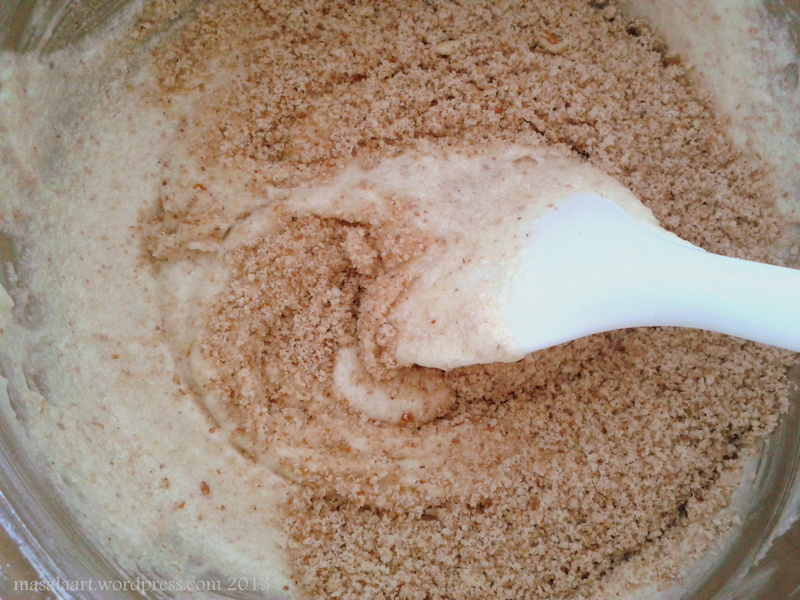 Fold in the almond meal and combine so the batter comes together. Pour batter into prepared baking dish and tap gently to even it out. 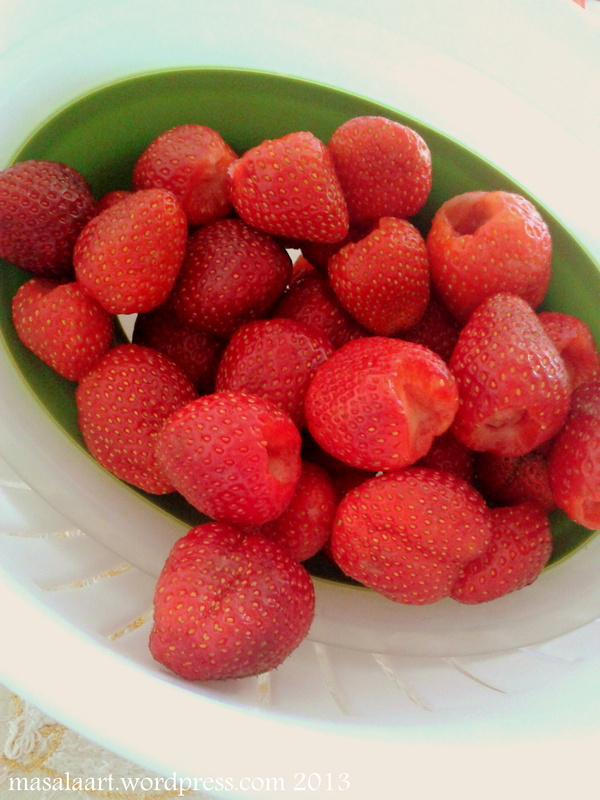 Arrange the strawberries, cut side down, in a single layer. Pack them as close as possible! Sprinkle some sugar on top, and put to bake. Allow the cake to bake at 180C for 10 minutes, then turn the heat down to 165C and continue baking until it appears golden brown on top or until a toothpick inserted comes out clean. I’m calling it Strawberrylove Cake because I baked it on Valentine’s Day. And what’s not to love about strawberries in a cake? « Happy New Year. On The Last Day Of The First Month Of The New Year! I am a huge fan of strawberries and almonds together in any form! They are great together! I have been putting almonds in everything these days- from oatmeal to toast! Hahaha! Yeah. And my son should be playing with jigsaw puzzles. I didn’t even wait for my husband to taste first! I know! I want to learn how to make marzipan next.